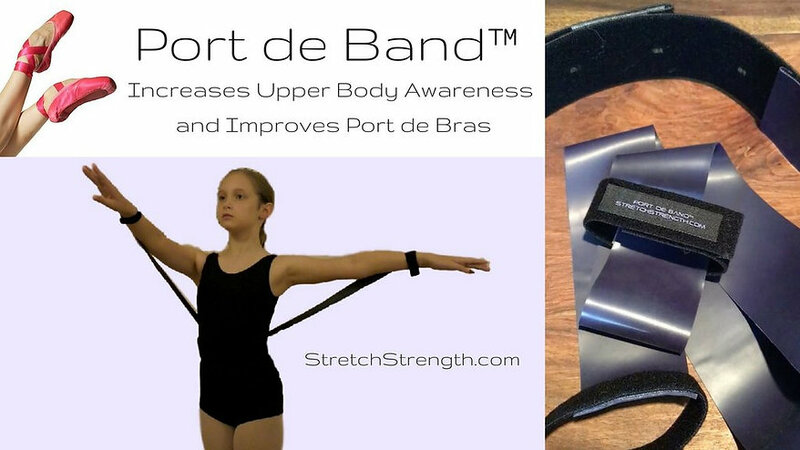 The new Port de Band by stretchstrength.com is a great tool to add to your COG kit for added back and arm strengthening! Read on for a full review and learn how to get your very own Port de Band! (Conditioning on the Go Kit – http://www.ansfptdance.com/freestuff) for added back and arm strengthening! 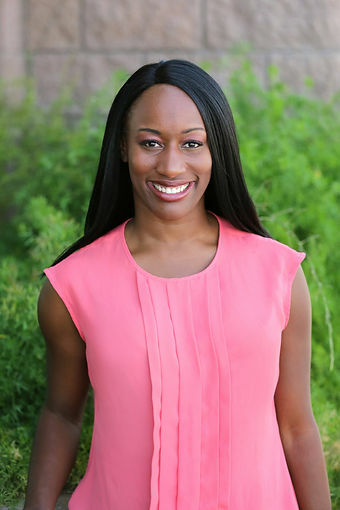 My colleagues know me for giving the “low down” on the dance/fitness industry’s newest products from a health professional’s perspective and the Port de Band fits right in as one of the newest products on the market. 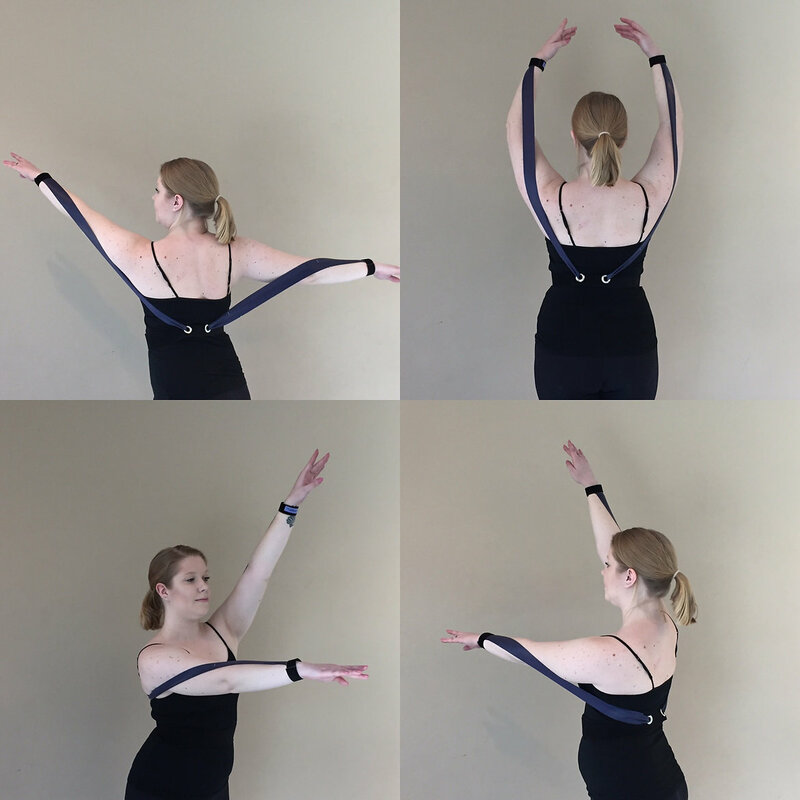 Designed to help dancers gain awareness of their arm placement and how they actively use their arms while dancing, it’s great for shoulder and back strengthening and it’s also a great tool for teachers to identify faulty posture and arm usage and easily correct them. The Port de Band uses 2 resistance bands attached to a soft Velcro belt that is worn at the natural waist. The waist belt easily adjusts and is comfortable on bare skin and dance or fitness clothing. The resistance bands are made from 99% latex free materials, so allergic reactions should be little to none, which is always a concern for my students and clients. Definite kudos to inventor Kim Shope for that detail! The lengths of the resistance bands are adjustable to increase or decrease the effort required for use. The Port de Band is no substitute for good training; it’s a great addition to your teaching and conditioning programs. Be on the look out for elevated shoulders or rounding out the upper spine to lift the arms against the bands. This typically means that the current tension is too much for the student and needs to be reduced by lengthening the bands out from the back of the belt where it is anchored. Attach the Velcro on the insides of the wrist for restriction-free arm movements, otherwise the bands will pop back and forth around your elbows. Don't leave Port de Band in higher temps, the heat can degrade the quality of the bands and straps. I’ve actually used the Port de Band on swimmers with shoulder dysfunction to help them with land training. I’ve also used it clients with tennis elbow, carpal tunnel syndrome, and thumb sprains. All of those conditions are frequently associated with poor posture and weakness of the shoulders. It’s an excellent way to strengthening the shoulder complex without using the painful joints by holding something like a resistance band or a dumbbell. ANSFPT says add this to your conditioning kit today! Click my seller link to buy!